good choice for Company,Large family, Mall and Gamers. our network. This is router ONLY, not a modem. 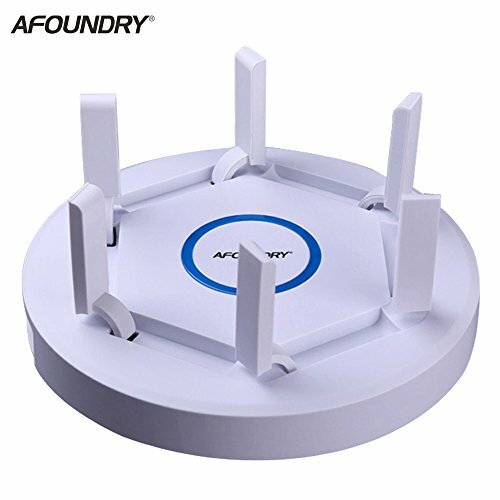 【Afoundry Latest High Power Router】EW1900 one new generation of EW series, features a new stylish look.High Power technology delivers whole-home Wi-Fi coverage, that's a combination of 6 high gain antennas. 【2600Mbps Dual Band Wireless Router】Dual Band(750 Mbps in 2.4GHz + 2166Mbps in 5GHz) WiFi speed up to 2600Mbps.Powerful WiFi performance to meet your high speed home and office network . 【4T4R Technology and 6 high-gain Antennas】4 x 4 data streams enable you enjoy 4K/HD video and online gaming on multiple devices simultaneously. 6 high-performance accurate antenna layout reduces the same frequency interference and improves the covering range and stability of the signal. The signal can penetrate 3 Walls. 【3-port Gigabit WiFi Router with USB 3.0】This new router equips with 2 1000Mbps LAN ports,1 1000Mbps WAN port.And 1 USB 3.0 Port offers remotely data transmission for storage devices. If you have any questions about this product by AFOUNDRY, contact us by completing and submitting the form below. If you are looking for a specif part number, please include it with your message.